This talk deals with open-loop control of open cavity ows with harmonic forcings. Two-dimensional laminar open-cavity ows usually undergo a super-critical Hopf bifurcation at some critical Reynolds number: a global mode becomes unstable and its amplitude converges toward a limit-cycle. Such a behavior may accurately be captured by a Stuart-Landau equation, which governs the amplitude of the global mode. 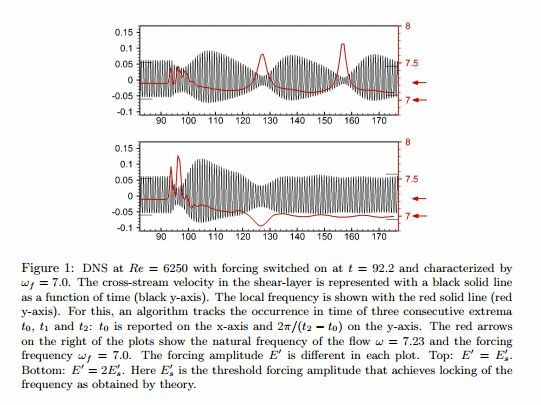 In the present talk, we study the e ect on such a ow of a forcing characterized by its frequency !f, its amplitude E0 and its spatial structure fE. The system reacts like a forced Van der Pol oscillator. In the case of a forcing frequency close to the frequency of the global mode, a locking phenomenon may be observed if the forcing amplitude E0 is suciently high: the frequency of the ow on the limit-cycle may be modi ed with a very small forcing amplitude E0 . A forcing structure equal to the adjoint global mode insures lowest forcing amplitude E0 . All predictions given by the amplitude equations are checked against direct numerical simulations led at a super-critical Reynolds number (see gure below).